A GUIDE TO NORTHEASTERN GARDENING: This Month's Color in the Garden: 12 Shades of Purple Blooms for Your Garden! This Month's Color in the Garden: 12 Shades of Purple Blooms for Your Garden! This Month's Color in the Garden! Welcome to This Month's Color in the Garden! Throughout history, the color purple has been associated with royalty, dignity, grandeur, devotion, peace, pride, nobility, luxury, and power. Throughout history, purple robes have been worn by royalty, and many believe this came to be due to the rare occurrence of purple in nature, making the dye expensive to create. Purple represents nobility, as in the Purple Heart awarded by the The United States Military to soldiers wounded in battle and In Thailand, purple is the color of devotion and peace for mourning widows. The lighter shade of purple, or lavender, has long been associated with beauty and femininity. And finally, in landscape design, purple is considered a cool, peaceful and calming color, which is wonderfully complemented by the warmer and more fiery shades of yellow and orange. Here are 12 shades of purple blooms to carry you throughout the gardening season. 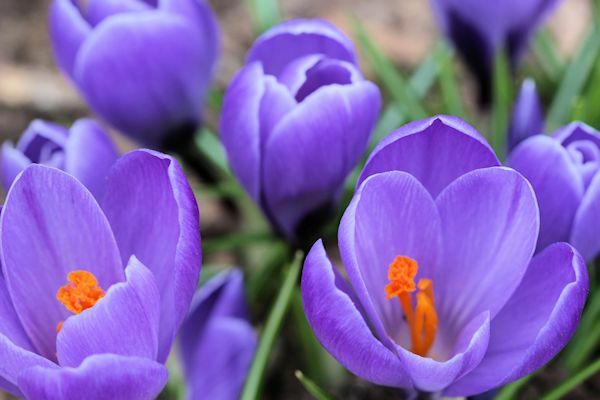 Crocus bulbs, when planted in fall, produce large blooms that are one of the first flowers to appear in early spring. Crocus are available in a variety of colors, this one known as Remembrance, due to its vibrant purple blooms. These beautiful bulbs are great for naturalizing in garden borders, and should be planted in an area of full to partial sun. Hardiness Zones 3-8, Height 4-6", Bloom Time: Early Spring. Hyacinths are a familiar sight in spring, generally blooming after crocus. Hyacinths are available in a variety of colors, but one of my favorites is the intense purple of the variety shown above. 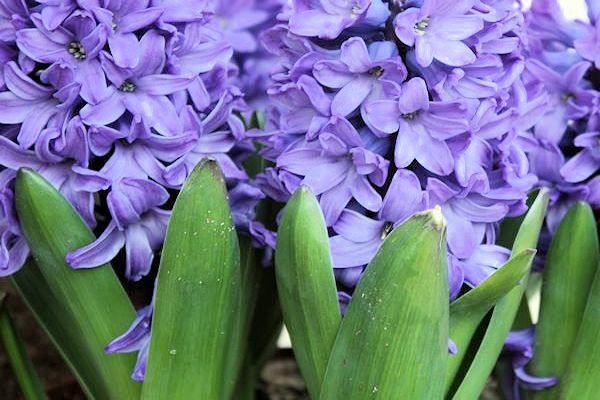 Plant Hyacinth bulbs in fall along with crocus for colorful and fragrant spring blooms. Hardiness Zones 3-9, Height 5-12 inches, Bloom Time: Early-Mid Spring. 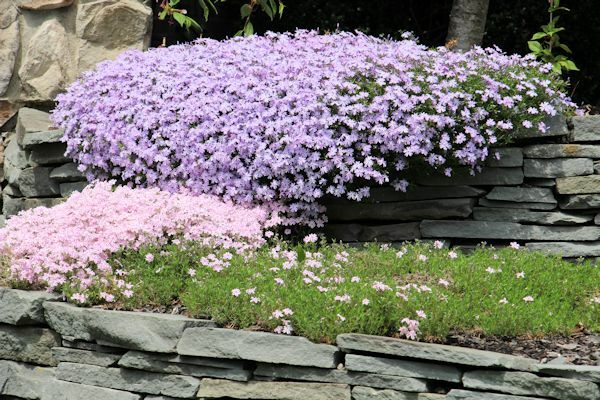 Creeping Phlox offers weeks of profuse and slightly fragrant blooms in late spring and are an attraction to butterflies and hummingbirds. After blooming, mossy foliage serves as a ground cover in the garden. Hardiness Zones 3-8, Height 4-6", Bloom Time: Mid-Late Spring. This hardy, deciduous vine can be twined into a tree that blooms in late spring. 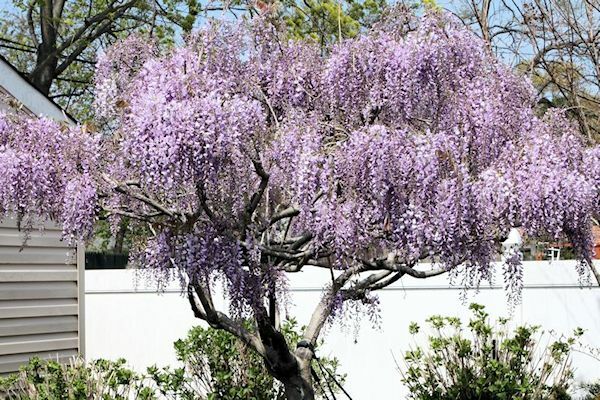 Wisteria displays long hanging clusters of fragrant pea-like flowers in blue, violet, pink or white, followed by hanging velvety green pods. There are many varieties of Wisteria, different mostly in the length and color of flower clusters. Hardiness Zones 4-9, Height 10-25 ', Bloom Time: Late Spring, Deer Resistant. Gray-green, aromatic foliage gives way to a soft lavender-blue flowers which are produced over a long period in summer. Thriving with little care and quite drought tolerant when established, this is an excellent perennial for herb gardens and tall borders. 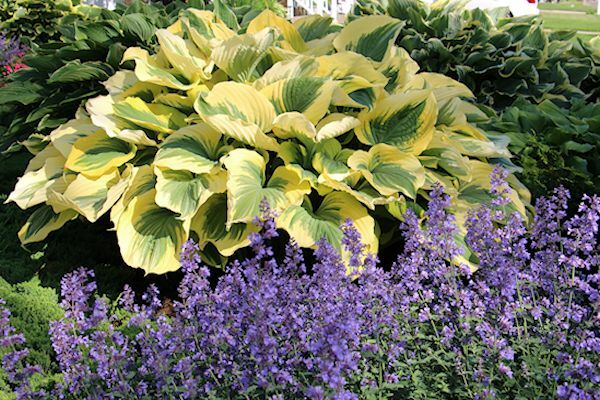 Here, Nepeta is planted along with variegated Hosta for a dramatic effect. Hardiness Zones 3-8, Height 2-3', Bloom Time: Late Spring-Fall, Deer Resistant and Butterfly Friendly. Rhododendron is a well known flowering evergreen shrub in the garden. This hybrid displays beautiful rich purple blooms on a hardy plant that can be used in an informal border or as a specimen. Hardiness Zones 4-9, Height 6-8', Bloom Time: Late Spring. 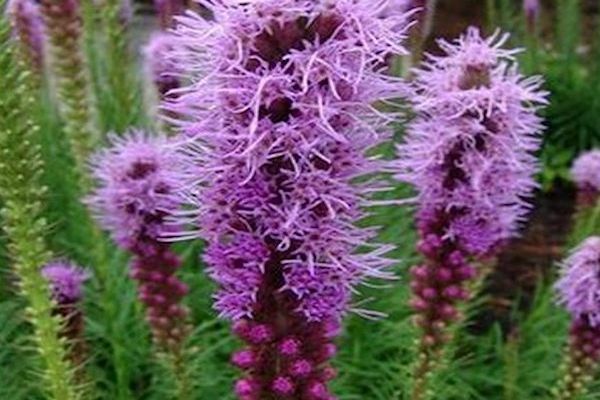 Liatris is a plant native to the northeast that forms small clumps with tall upright stems. Tall narrow spikes of mauve-purple flowers flower for long periods of time and are drought and heat tolerant once established. Hardiness Zones 4-9, Height 30-36", Bloom Time: Mid-Summer to Early Fall. Twist-n-Shout Hydrangea produces abundant pink to purple blooms (depending on soil type) in late summer. 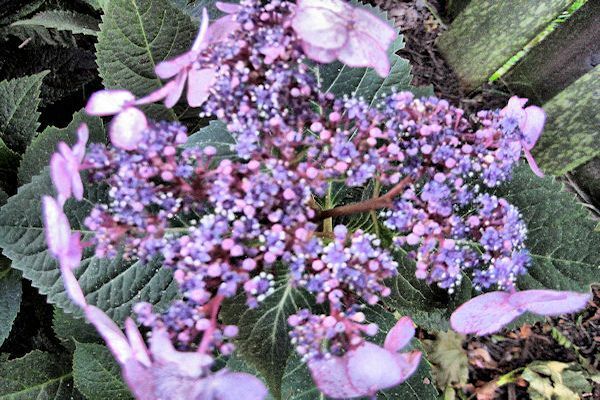 Twist-n-Shout displays elegant delicate blooms on a lace-cap variety of hydrangea that blooms on both old and new wood, making it hardier in colder climates. 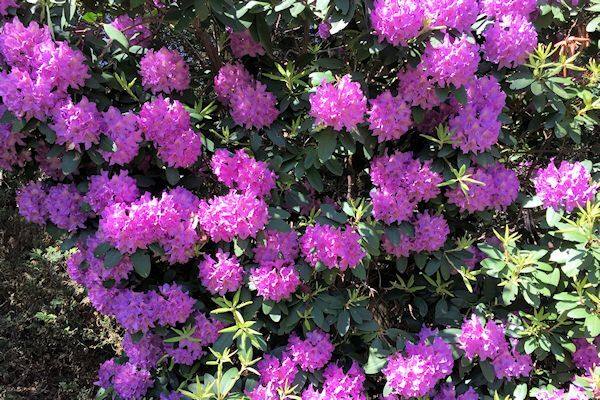 A neutral-acidic soil encourages purple blooms. Hardiness Zones 4-9, Height 3-5', Bloom Time: Mid-Late Summer. 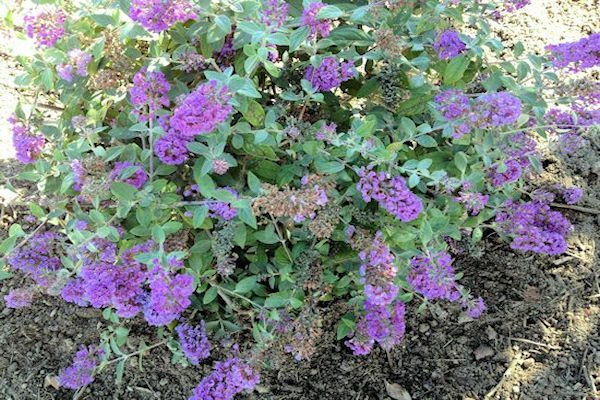 Lo & Behold Buddeia is a dwarf form of butterfly bush, grown for its compact, non-invasive habit and elongated clusters of flowers, This dwarf variety has silvery gray-green leaves on a low spreading multi-branched plant, and produces clusters of fragrant, purple tubular blooms. Hardiness Zones 5-9, Height 2-3', Bloom Time: Late Summer-Fall. Deer Resistant and Butterfly Friendly. 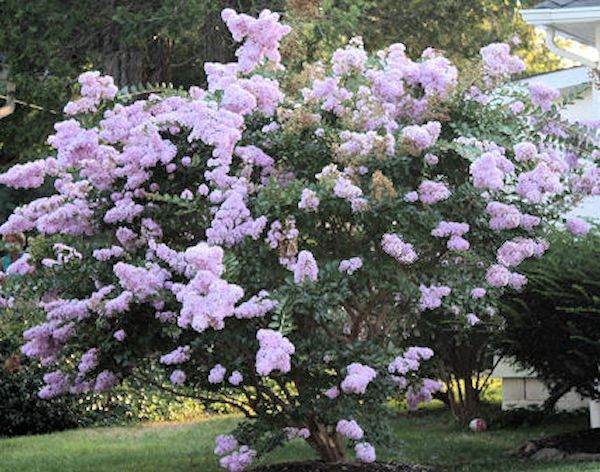 Lagerstroemia, or Crape Myrtle is available is a multitude of varieties and are known for their long bloom time. 'Muskogee' produces light lavender blooms that appear in late summer on glossy green foliage that turns red in fall. The interesting cinnamon colored bark peels to a shiny light gray for a dramatic effect. This large shrub or small tree makes an excellent specimen or group planting. Hardiness Zones 6-9, Height 15-20', Bloom Time: Late Summer-Fall. 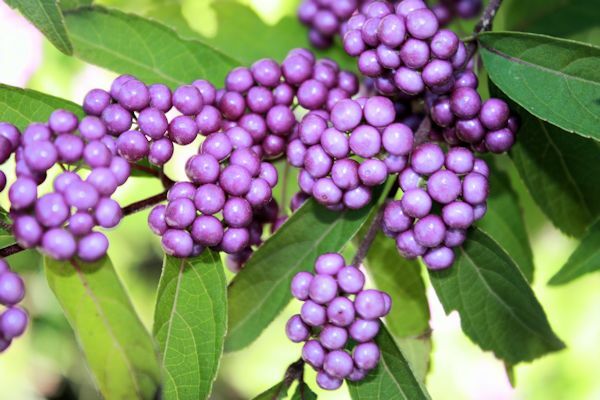 Finally, 'Early Amethyst' Callicarpa displays arching branches with clusters of pale lavender-pink flowers in summer, that develop into masses of glossy amethyst berries in fall. Callicarpa is easy to grow as a specimen or hedge, and is good for naturalized areas. Hardiness Zones 5-8, Height 3-4', Bloom Time: Summer with Berries in Fall, Butterfly Friendly. 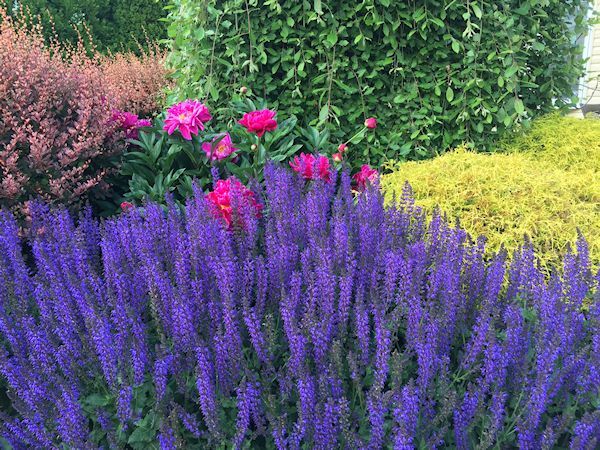 Purple blooms are versatile and fit into just about any garden style. They can add a stunning display of color to your space throughout most of the gardening season, and in some cases, these gorgeous purple blooms are known for attracting butterflies and hummingbirds, due to their vibrancy and fragrance. 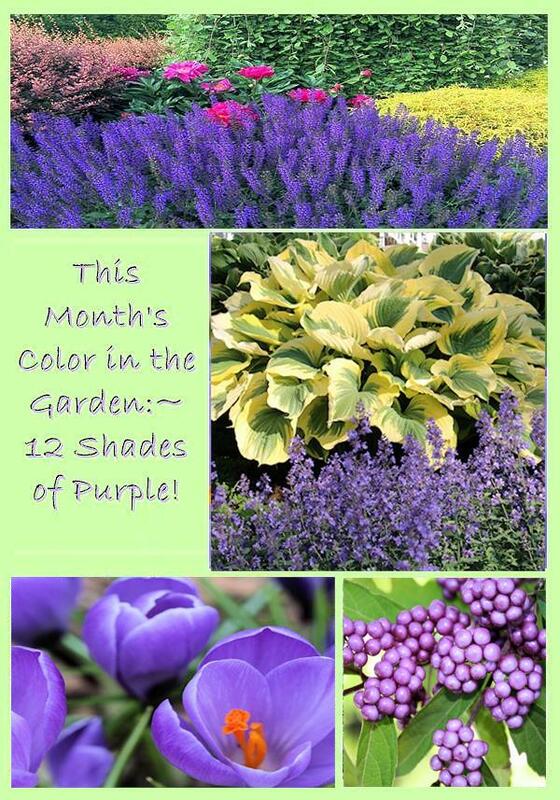 Be sure to add some purple to your garden plan this season, and it will be sure to delight! Are you an experienced gardener or just wanting to learn? If so, be sure to check out my two published books on Amazon. My first book, A Guide to Northeastern Gardening, is loaded with ideas for different types of gardens and what plants to buy, along with gardening tips and advice on how to maintain your garden once implemented. 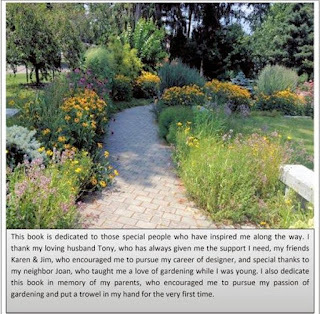 The second book, Landscape Design Combinations, is geared towards the hands on "DIY" gardener who is looking for a little guidance, along with a dash of inspiration! This latest publication builds on the first and is full of successful landscape designs that can be used as is or as a guide. 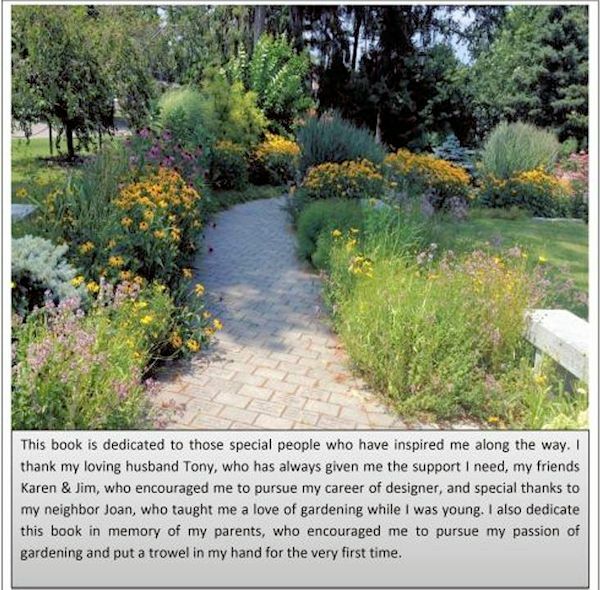 The book also teaches design principles using evergreens, flowering trees, shrubs and perennials. To preview each book, simply click on the links below! Beautiful colors. I wish I had a bigger garden. Thank you Marijke. Your roses are Peony are beautiful! I love purple in the garden. So glad I planted salvia as it really is pretty and lends wonderful color. The purple of Salvia May Night is so vibrant this time of year. I am glad you are enjoying some in your garden. P.S. I really haven't forgotten to review your books. Coming soon. Hi Pam. I know you are really busy. Whenever you get to the review is fine. I really appreciate your thoughtfulness and am thankful to have such wonderful online gardening friends. I'm glad I reminded you about the Lo & Behold. They are beautiful, low maintenance and non-invasive, so you will love them!